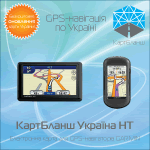 Purchasing one copy of CarteBlanche Ukraine NT map for Garmin® navigators and compatible navigation devices gives you the right to use the map with one device. To use the map with a certain device, it is necessary to obtain a map unlock code for this device and enter it during the map installation process. The map unlock code, as well as the device ID, is also used to download updates of the map. Each copy of CarteBlanche Ukraine NT Map, purchased on a CD/DVD disk or online, includes a coupon containing a serial number and a code. This coupon allows to obtain the map unlock code for the chosen device. Each copy of CarteBlanche Ukraine NT Map, purchased on a flash card, already contains an unlock code, and does not contain a coupon. CarteBlanche Ukraine map users who had not upgraded to CarteBlanche Ukraine NT map before 07/21/2010, may use CarteBlanche Ukraine NT map if their devices are compatible with it. To download and install CarteBlanche Ukraine NT map, the unlock code obtained for CarteBlanche Ukraine map can be used. If you have purchased a copy of CarteBlanche Ukraine NT map for Garmin® navigators and compatible navigation devices on a CD/DVD disk or online, and would like to obtain an unlock code for your device, please move to ordering an unlock code. If you already have a CarteBlanche Ukraine NT unlock code for your device and would like to know how to use it to install and unlock the map in your device, please move to using the unlock code.